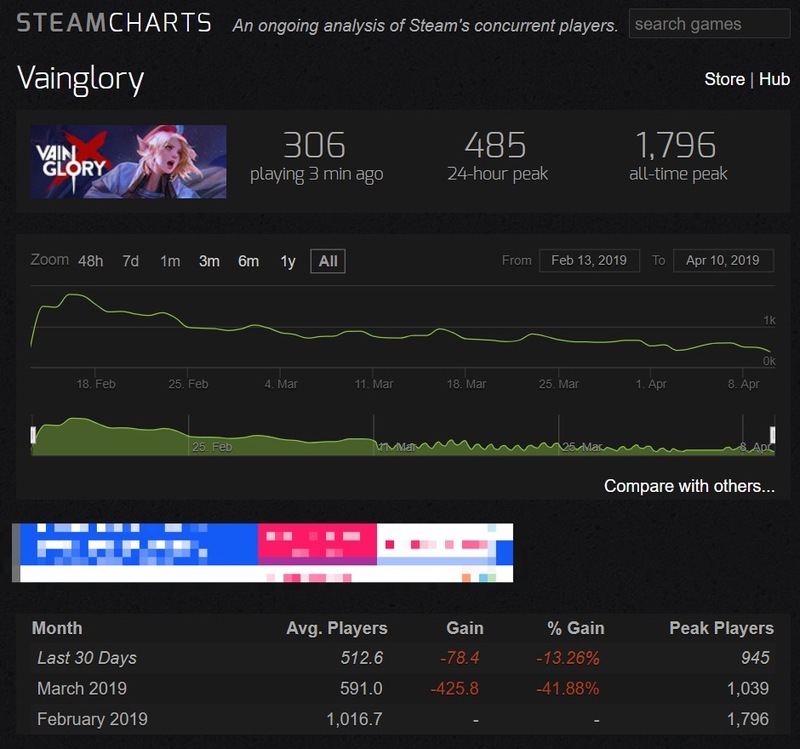 Vainglory on steam is basically dead at the moment, considering cross-platform has been semc’s main focus for the past 10 months the future of the game doesn’t look bright … sadly. 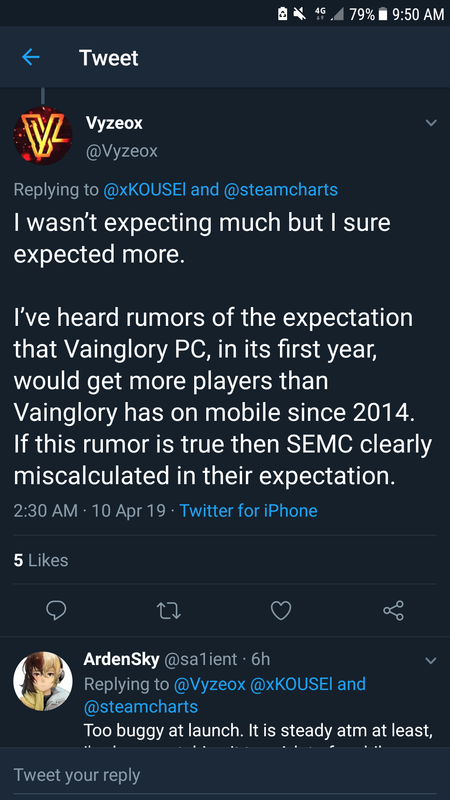 If this tweet is indeed true then this really shows how clueless semc are. If they wanted 5vs5 that should had been entirely new game with all from scratch. Sure, they can bring back VG 3vs3 heroes and items, but reimagined in a way to keep their spirit while matching the skills/passives to 5vs5 and the new map that should had been different (like more objectives, more dynamics on the map like literally moving elements, even a secondary floor that can be accessed few times per game, a lot can be done to live things up - we are not talking about supa dupa different things, but atleast some more cool elements added to the map on top of the few we have now) + while now it’s not bad, I would say higher quality as the fold is still with more small details and clearly made with love from the top to the bottom. 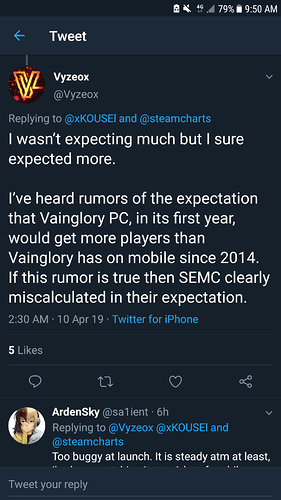 Edit: Also I think it’s safe to say that atleast half or even more of those players are VG veterans playing on their PCs, so it’s -1 from mobile/ +1 for PC and this is not exactly a growth. At the time when 5v5 was announced 3v3 or Vainglory as a game was at it’s peak it didn’t have any major issues besides fixing some bugs and a lack of progression system but the game was definitely in a healthy state. Releasing 5v5 was definitely a step in the right direction but the execution was just terrible, every single aspect of it. What really killed the 5v5 hype was patch 3.1, the most awaited patch in vainglory’s history ended up being the most disastrous one. Semc’s stubbornness once again leads to a complete disaster, some players were placed in t4 and couldn’t get out with a 90% wr, others in tier 4 would get 3500 elo in one win, others were placed in t8 but with disproportionate elo gains, you name it … Players have been begging for a new more traditional elo system where players would start climbing from scratch but instead they had to spend the first 2 weeks of the update trying to fix elo bugged account (which still exist). Once they supposedly fixed the elo issues (they really didn’t), players quickly discovered how terrible the matchmaker is. They also discovered how bad the meta is in 5v5 with the 2v1 match ups and the gold funneling strategies. Semc’s stubborness strikes again, it took them nearly 10 months to get rid of jungle ambient gold the obvious fix to those issues but instead they kept messing up jungle spawn timers and lane minions waves cause they just refused to remove ambient. 5v5 was accessible to test for the public for just 2 weeks and obviously nothing was tested in such a short period of time. Instead of putting tickets in rng chests, they should have created a program where people can sign up for 5v5 early access testing and they would choose those who seemed fit to test the game. The program would have craterias such as how long you’ve been playing Vg, rank, involvement in the community and 5v5 mobas experience and the testing phase should have last at least 6 months and semc would get feedback on how to improve the game. If a new ranking system was added where players would start from bronze 5, if the game was in early access testing for longer with qualified people testing the game, if duo and trio q were removed from the get go from 5v5 ranked, if they added an improved progression system and if they worked on some of the annoying bugs, i am pretty sure the game would be in a much better state right now. Instead they completely rushed 5v5, released it and shifted focus on crossplatform. OH gurl those numbers are looking so SAD. 945 peak players? Yikes. I wonder what SEMC’s “next big priority is” at this point. They always seem to shift their priorities to, IMO, the dumbest things, or at least they never really fulfil those priorities in the end of the day. I could told them that in this state the PC version will not be popular at all and literally bad time/money/dev power investment to pull off… dunno how they didn’t foresee the same. I would go as far as to say that even super polished version with all the needed PC features and exclusives will have a really hard time to stay afloat next to lol and dota. I don’t mind the PC release, but its timing was just SOooo bad! Nevermind the fact that they released a very buggy build that lacked so many essential features from already-established MOBAs, the out-of-game experience of VG is still utter trash compared to its competitors even in the mobile market. They as much as said they did not expect VG one PC to be hugely successful. The was to release in early access to get a larger pool of player feedback on different systems, considering since then PC has gone from buggy mess to nearly completely playable in all respects would say that’s been a success. Now they just need to polish up the VG experience as a whole to the point where player retention is high enough that advertisement would be worth it. What do you mean about heroes intentionally being OP on release? genuinely curios. We most recently had Sen Feng who is maybe A tier, but not op or ban worthy at all. He was considered strong on release but despite having no nerfs has not been nearly as contested this update. Before him we had Ylva who was and still is even after buffs under powered. Magnus was very strong on release. Inara was pretty balanced if under powered. Yates was over valued due to players not knowing how to play against him, but was still pretty op. Silvernail was actually not amazing on release (more than likely because of his high skill cap more than anything) but it could be argued he was kind strong? he really did not see much use until the next patch. Like, empirically maybe half could be considered op (generously) and the the other half were pretty weak. What is what you would expect from new heroes right? I’m not surprised. Sure, The community’s response to this didn’t exactly help, but to be honest SEMC did kinda bring that upon themselves. Sure, crossplatform isn’t a bad idea, but, as I, and a million other people (who am I kidding it’s not more than the 1796 peak time players VG apparently has) have said, not with the game in it’s current state! Also I still blame people like Excoundrel for this, people who are all just “oh look at this good thing SEMC have done it’s amazing there’s definitely no negatives here”. I personally haven’t opened the game since a day after 4.1 dropped and I doubt I will do again anytime soon (unless I get really bored). I’m not gonna say Mac out yet because I still can’t bring myself to delete the app, but I’m tending towards it. San feng is literally banned in every game what are you on about, San Feng Magnus Anka Malene Kensei Kinetic Yates Churnwalker Varya were (some still are) either broken or overpowered. And from what i’ve seen Caine is set to join the list, Inara Silvernail and Ylva were the only heroes that they got right, 10 of the last 13 heroes released were broken or ridiculously overpowered this is no coincidence. The biggest giveaway that they purposely make new heroes broken is when they overload them with stats, like San Feng who’s already ridiculous as it is and they felt the need to make him use no energy. An other giveaway is when they refuse to hotfix new heroes that totally break the game or even to nerf them the following patch, if anything an even bigger giveaway is when they buffed Magnus when he was already strong to make him overpowered status. since then PC has gone from buggy mess to nearly completely playable in all respects would say that’s been a success. Actually, with less than 500 concurrent players (a number which has been steadily decreasing – I’ve been watching it since release), I’d say the PC release was an unmitigated disaster – a waste of resources that should have been spent addressing the glaring and longstanding issues with the game. Without discussing San Feng, I just want to comment that hero viability/power can change even if he itself is not touched at all - changing items, other heroes and even the meta - all can affect how strong is a X hero that was not changed at all. A think some of the new bugs that are quite serious are coming from the PC version. For example that "I can’t autoattack around the turret an enemy) can come from the mouse/keyboard support, who knows? That 500 number seems like it can’t be right; either Steam is not tracking properly, or a majority of PC players aren’t using Steam. The number of players I’ve talked to on the PC just does not match with only 500 playing the game; there’s no way I’ve talked to anything close to 10% of PC players, but between reddit and in game I’ve probably talked to close to 50 PC players. Steams numbers are either wrong, or they don’t actually reflect the state of the game on PC. VG might not be healthy, but it’s player base is orders of magnitude off from what Steam shows. I think most likely is that PC players just directly downloaded the game instead of going through Steam. I never use Steam if I don’t have to, and I imagine other players are the same. I never said that the numbers above represented all people playing VG on PC. That number is unknowable, because SEMC guards that data as though national security depends on it. However, the Steam numbers are accurate, because they’re directly reported by Steam. All that misses the point entirely, however, which is that the time and effort put into the PC release was poorly spent. The Steam numbers are simply a data point that supports that argument. Those are the number of people playing Vg on pc via Steam not the entirety of the pc player base. The numbers are 100% accurate tho. I don’t think the Steam numbers are a data point when talking about the PC release though. I haven’t really looked at Steam recently, so I have no idea how the game is represented there, but something seems to be keeping the numbers low there. That doesn’t mean the VG on PC is healthy, but Steam’s numbers are so far off from those of the PC base in general that I don’t think they are relevant to PC downloads in general. The Steam numbers are useful for showing that the Steam launch is a flop, but you’d need to show something more to show that they somehow represent the PC launch. Actually, since you’re asserting that those numbers aren’t representative of the PC player base, the obligation is on you to provide something to back up that assertion. So far, you’ve mentioned you know 50 people that play on PC. My issue is that I’m not sure they are a significant fraction of the PC base either. I don’t think they are representative of anything except for Steam.